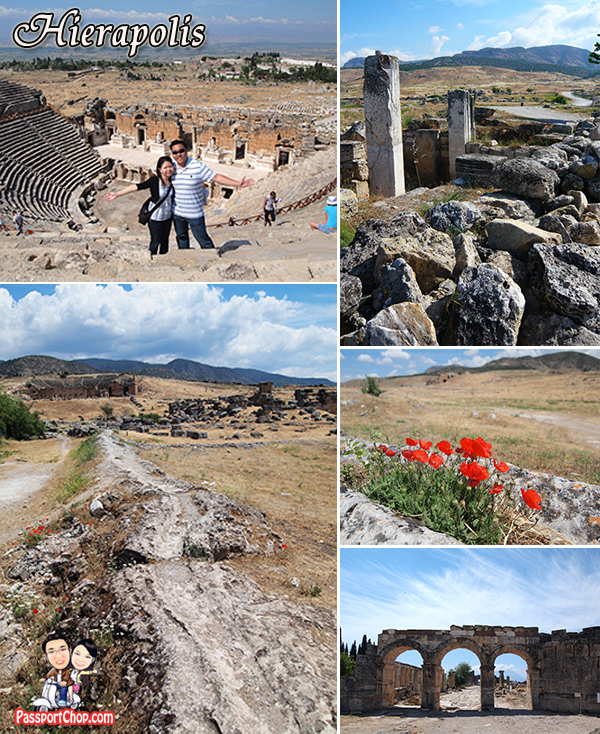 Continuing on from our Day 1 exploration of ancient Greek city of Ephesus, we visited the famous cotton castle, Pamukkale and the historic Roman city ruins of Hierapolis on Day 2 of our 2D1N tour from Fethiye organised by TinyAkropol agency. Just like the Greek city ruins of Ephesus, the Hierapolis has a long history of 2000 years. This city started out as a healing centre where doctors used the hot thermal springs around the area as a treatment for their patients. It gradually gained wealthy and had more than 100,00 inhabitants at one time – thus the majestic structure of a Roman-style amphitheater and many city structures e.g. fountains, Roman baths. However over the years, these buildings had been destroyed by war and earthquakes in the area, leaving behind the ruins we see today. It was said that the water in this Cleopatra’s Bath is good for heart diseases, atherosclerosis, blood pressure, rheumatism, eye and skin diseases, rickets, nervous disorders, nervous and physical exhaustion circulatory problems – Amazing right? Of course, with so many health benefits, there is always a cost to it. 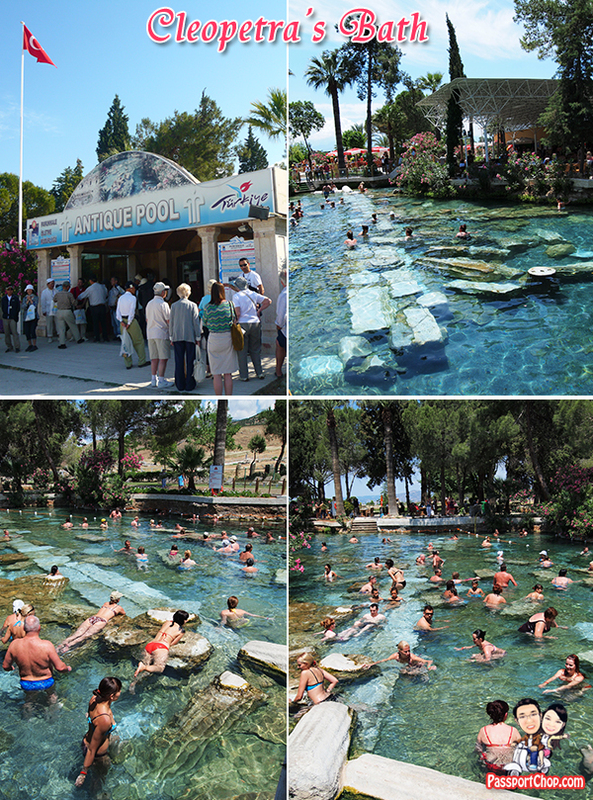 To swim in the Cleopatra’s bath will cost you 25 TL (about 25 Singapore dollars). For children aged 6-12 years old, it will cost 10 TL. To rent a safe box to put your valuables will cost you another 3 TL. What’s cool about this place is that it’s free to roam about the pool (without swimming) for free. 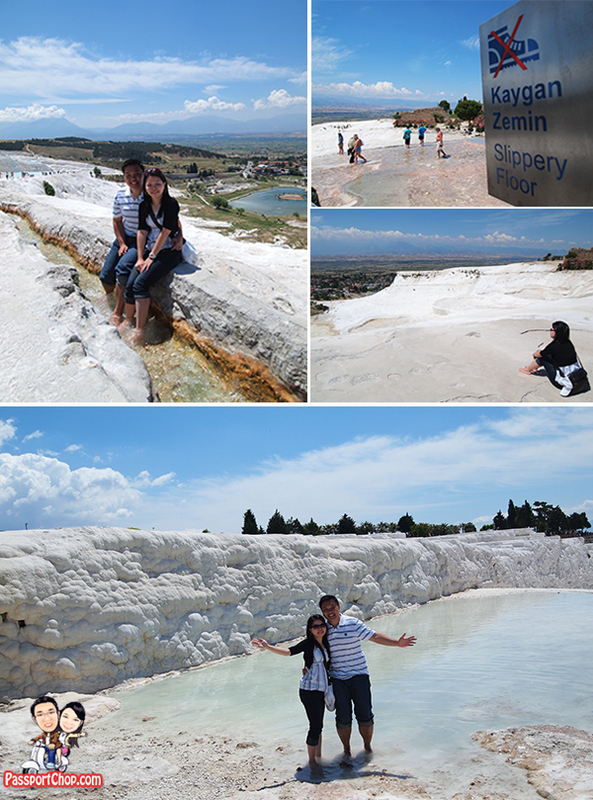 The other attraction of this area is the Travertines of Pamukkale. Pamukkale means “cotton castle” in Turkey and it is easy to see why it is named as such from the white cotton-like appearance. The travertines are a series of interesting-looking cliffs of bathing pools filled with calcium water, overlooking the town of Pamukkale. The travertine are created from the shifting of fault lines in the area (don’t know what fault lines are – check out your geography textbook). As the fault lines shifted, very hot springs with a very high mineral content (notably chalk) are pushed out to the area. Apart from the slightly radioactive minerals, the calcium and hydrogen carbonate react to create calcium carbonate (also known as travertine) and limestone. Thus, giving Pamukkale the white appearance and the formation of these travertine cliffs. Over time, these calcium carbonate deposits took over part of the Hierapolis ruins, creating impressive sites such as the Monumental Tomb – the solitary tomb being engulfed in the whiteness of the travertines (see middle right picture below). 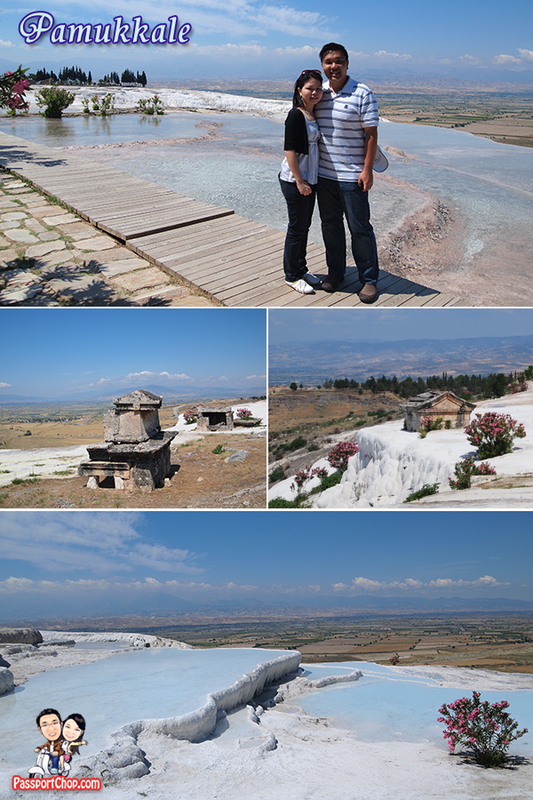 Admission to the Pamukkale travertines cost 20 TL and it includes entrance to Hierapolis (Cleopatra’s bath is separate). Most people go there with tour groups which will usually bundle lunch with hotel stay and visit to Ephesus for tours from Istanbul and cruise shore excursions from nearby port of Kusadasi – avoid going there at noon as it can get quite hot due to the reflective white surface. You will have to take off your shoes before walking on the travertines to avoid polluting these beautiful travertines, so if you dont want to take the risk of walking home barefoot if your footwear are stolen – bring a bag (although we didnt encounter this problem). The floor is quite slippery and the travertine pools might look clear, there are a lot of pebbles and small stones in it – so walk carefully to avoid cuts. Other than these concerns, enjoy your time and take lots of pictures with these beautiful travertines. Wow. I’ve always looked for a blog about this. Thanks! I just discovered your blog and I have to say that you have a great content. Thank you for sharing some great information and tips about Pamukkale! Looks like you enjoyed your travel there.